Mandarin Chinese with Mandy and Pandy for Kids 3 - 6. 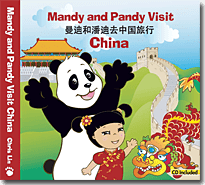 Mandy and Pandy is a series of six board books accompanied by an audio CD. Mandy and Pandy make learning Mandarin Chinese fun and easy. Each book is $15 plus shipping. An audio CD with English and native Chinese narration for correct pronunciation. 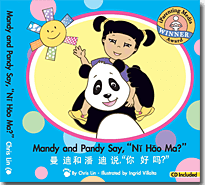 Mandy and Pandy Say, “Ni Hao Ma?” – Teaches simple words and phrases. 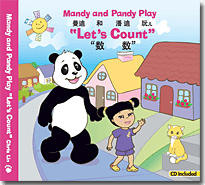 Mandy and Pandy Play, “Let’s Count” – Teaches counting from 1 to 10. Mandy and Pandy Visit China – Teaches travel and food vocabulary. 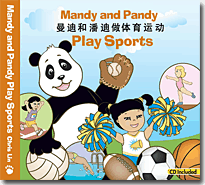 Mandy and Pandy Play Sports – Teaches vocabulary for different sports played in China. Mandy and Pandy Play, “What Colors Do You See?” – Teaches vocabulary for objects around a lake and what colors they are. 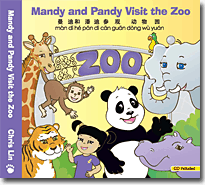 Mandy and Pandy Visit the Zoo– Teaches vocabulary for zoo animals.